Apply coating at room temperature (between 18’C and 22’C). Use heaters to warm the room if too cold. Good surface preparation is the key to a long-lasting finish – follow the instructions carefully. Once the TUBBY coating and the Hardener have been mixed together, the contents must be used up within 6 hours before they solidify. The bath may be used 48 hours after application provided room temperature is maintained between 18’C and 22’C. The use of anti-slip rubber mats is discouraged. However, if one must be used, wait at least 10 days after application or full curing to take place before placing mat in bath. If the bath surface has been resurfaced previously, a suitable paint stripper, such as Nitromors General Purpose, must be used to remove the old coating completely. Any stubborn remaining bits will come off easily when you use the Preparation Pad in your power drill. This coating is not suitable for toilet interiors. When resurfacing domestic appliances (washing machines etc. ), it is not necessary to strip the original surface off the appliance. However, any flaking surfaces must be removed and rust areas sanded clean and filled. Cellulose / lacquer thinners can be used for cleaning purposes. Any dust or imperfections (including ‘orange peel’) in the new surface can be removed after the bath has been in use for 7 days, by using our own TUBBY POLISHING KIT or 1200 grit wet/dry abrasive paper, followed up by using polishing cream, such as T-Cut car restoration polish. Make sure the bath, paintbrush, paint tray and roller heads are dust-free prior to use.Before surface preparation, remove and synthetic sealant (excluding tile grouting) from the gap between the bath and tiles. DO NOT use a chemical sealant remover, but manually remove sealant with a Stanley knife blade and vacuum cleaner. The TUBBY coating will not adhere to silicone, so it is important not to leave any traces of silicone on the surface. The wearing of Safety Glasses during use of the Preparation Pad is advised. Do not use Preparation Pad on acrylic surfaces. Using a plastic jug pour water all over the bath surface to wet it. Open the cleaning powder sachet and sprinkle the powder all over the wet surface. Half fill the jug with water and place it in the bottom of the bath. Dip the green pad (or even a green pot-scouring pad from your kitchen) into the jug and systematically scour the bath surface thoroughly to remove soap and oil residue. Pay special attention to the edges against the wall, around taps, outlet and overflow. Do not miss any areas of the bath surface as the whole preparation process hinges on this step. When cleaned completely, rinse off thoroughly with warm water and wipe dry. Put on a dust mask and safety glasses, if you have them. Attach the Preparation Pad to your drill and proceed to abrade the surface, applying the flexible pad at approximately a 45’ angle. Work in overlapping strokes until you have scratched the whole surface to obtain a good key. Pay special attention to rusty areas. Use the wet/dry paper to do any additional sanding where the Preparation Pad could not reach. Take special care around taps and outlet, where the Preparation Pad could damage the chrome. Use paper towel to soak up excess water around the outlet, overflow, taps and edges against the wall. A hairdryer is useful to ensure surface is completely dry. When the surface is completely dry, using masking tape to mask the edges against the walls (2mm above bath surface), around outlets, overflow and taps. Cover taps and overhead shower unit with a pad of tissue paper and the plastic bags, taping securely. llow Filler instructions. Vacuum any dust from sanding the filler. Now apply the Degreaser / Adhesion Promoter, following the specific instructions included. Finally, wipe the whole surface with the Tac Cloth to ensure the removal of any fine dust or lint. Shake the tine of Tubby coating very well for 2 -3 minutes. Make up a set of spare Repair Material to keep in case of future accidental damage. Instructions on pack of bottles. Pour all the contents of the Hardener tin into the Tubby coating tin. 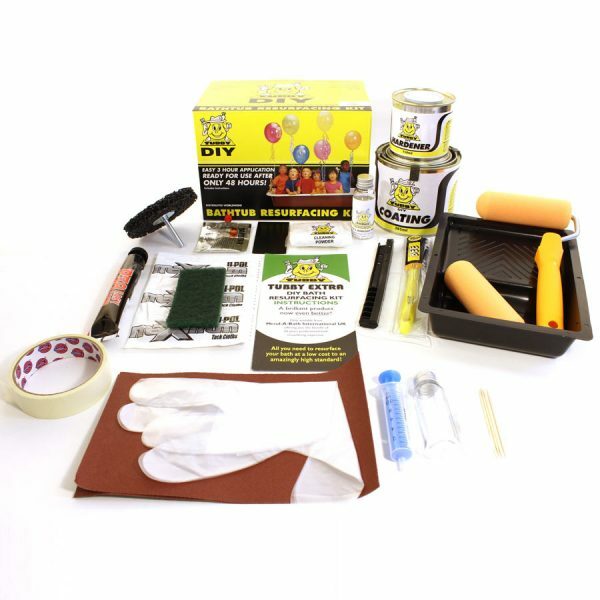 Mix contents well with paint stirrer. Replace lid securely and shake well. Loosed lid and leave to stand for 5 minutes before application. Put on gloves. Pour approximately one third of the mixed coating from the Tubby coating tin into the paint tray. Replace lid on tin. Ensure the surface is dust-free and completely dry before applying the coating. Using the paintbrush, brush areas that cannot be reached with the roller (e.g. outlet, around taps etc). Place the paintbrush into a plastic bag to keep it from drying out, ready for the second coat. Fit roller head to roller handle and apply the first coat thinly with even strokes. Roll as close to the edges as possible, overlapping brushed sections to obtain a smooth finish. Do not try to fully cover any remaining underlying stains that the bath may have. Roll lightly and evenly all over the surface but do not repeatedly over the same area, as this will agitate the surface when it is beginning to set, resulting in an ‘orange peel’ effect. Key Tip – As soon as the material is spread evenly, move on! After the first coat has been applied, remove roller head and discard. Allow the entire surface to dry for a minimum of 1 hour and a maximum of 2 hours between 18’C and 22’C. A heater may be used to heat up the room in cold conditions. Put on second pair of gloves and attach second roller head to roller handle. Pour remaining coating into the paint tray. Using the paintbrush and roller, apply the second coat liberally, avoiding runs. Important – roll lightly and evenly ensuring that you do not roll repeatedly over the same area. On completion, before the coating dries, carefully remove all the masking tape by pulling it up and away from the surface. Remove the masking tape from around the base of the taps, but leave the plastic bags on the taps until the surface has cured completely to prevent water dripping onto the new surface. If you are unsure about any aspect of the resurfacing process, please contact us before you attempt it. Use a bath cleaning sponge (with white non-scratch surface) with a liquid detergent. Do not use cleaning products with a high ammonia or alcohol content. Do not use hair dye or strongly coloured cosmetic products in your bath, or leave bottles standing on the bath edge where staining could occur. From time to time the surface can be cleaned with a mildly abrasive cream cleaner and can also be polished with T-Cut car restoration polish to restore shine, if necessary.